The twelve strings produced by the Oscar Schmidt company in the first quarter of the 20th century are coveted for their big sound, rarity, and association with the bluesmen who recorded on 78 rpm records in that time period. Perhaps rarer than the 'Leadbelly' jumbo 12-strings are the jumbo, or 'Auditorium' size, six-string Stellas. We've handled perhaps five or six over the years, and have seen maybe another half-dozen, but that's about it. So we're really happy to introduce this example of the jumbo six. This one was built likely in the 1920s. The back and sides are walnut-stained birch and the top is spruce. The neck is likely poplar with a black-painted fingerboard. The pyramid bridge is Brazilian rosewood. The top and sound hole are adorned with inlaid 'rope' binding, and the back with a 'decalcomania' strip. Both top and back are bound with white celluloid. The scale length is just about 26 1/2", and the jumbo body measures 15 3/4" across at the lower bout. The neck measures ~ 1 15/16" across at the nut, and string spacing is 2 5/32" across at the saddle. The neck is a full 'V' carve, typical of this time period. The top is ladder braced, two below the sound hole, and one above plus the typical Schmidt bridge plate/brace. Although 100% original but for the bridge pins, this guitar has seen a number of repairs through it past. 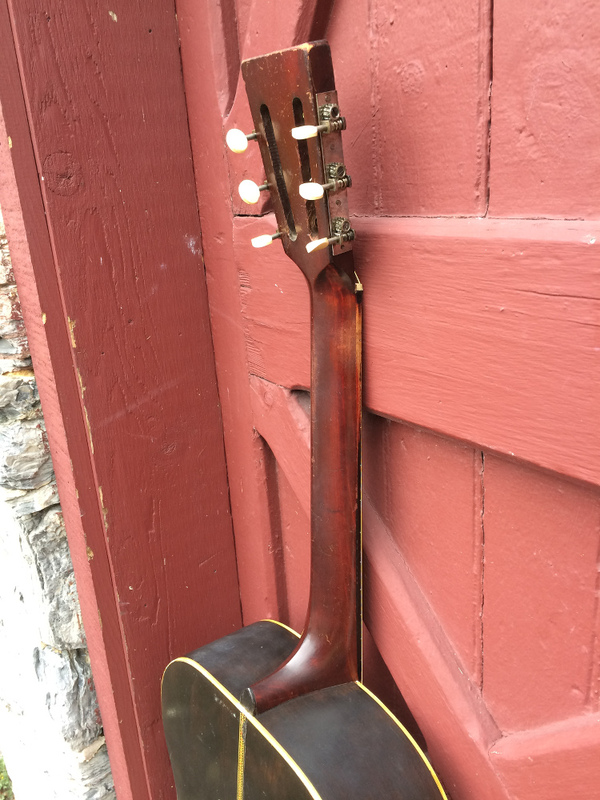 Several top cracks were repaired, including one that was spliced from the bottom of the sound hole to the end of the top. A flat, lateral brace was glued under the area of the fingerboard extension to stabilize this area, and two small braces were added on each side of the sound hole to prevent top warp (this is a fairly common structural support seen retrofitted on ladder-braced guitars). The bridge has two splits that were glued, plus evidence of two screw holes that were filled. The back has three cracks that were glued. All these old repairs appear stable if not somewhat ham-fisted. Recently, the neck was reset, some brace tips glued, and the frets leveled and polished. Some bridge plate string-ball divots were filled. The tuners were disassembled, cleaned and lubed and function well. The guitar shows various nicks and dings from use, but exhibits a beautiful patina. Action is set at 6/64"; the neck is straight and the guitar plays with ease. We don't typically gush over the sound of our guitars in our descriptions, but we're going to say it here: This is the best sounding OS Stella 6-string we've ever owned or played .. any size or wood combos.. and we've played a lot! It has warmth, depth, clarity and 'thump' .. all the things players look for in vintage 000 Martins, actually. If you're looking for the ladder brace 'bark', this is not the guitar for that sound .. that said, it's a great blues or ragtime guitar, but it has much more to offer a player.